I am not going to make it to 80; there are no octogenarians in my family and I’ve been doing everything possible to croak early enough – I smoked, I drink, I drive on I-35, I eat whatever I feel like and I have plenty of stress in my life. Even though I am not planning to live that long I always wondered when comes the turning point in a person’s life when one stops caring what the other people think and starts enjoying life without being burdened by societal restrictions. Whatever this may manifest itself in: jumping with parachute when you are 80, riding a bike for the first time, farting at the table, getting a tattoo or singing even if you can’t. Who cares if you wear ‘depends’, or ride a scooter, or your skin is wrinkly. This subject was brought up in the movie “The Bucket List” where Jack Nicholson and Morgan Freeman portrayed terminally ill old guys who set out to use the short time they have left to live out every dream and fantasy that they escaped them throughout their lives. Young@Heart is also about the end of life but it doesn’t have to use any dramatic devices to bring the viewer to tears, because the people on the screen are not actors, they are real living members of the Young@Heart Chorus from Northampton, MA. After watching the movie and seeing 80-year-old’s enjoy themselves performing songs that don’t fit their stereotype I couldn’t help but think how hard the same thing would be for me. So somewhere between my age and their age there is a point where I would transition from thinking that I am making a fool of myself, to just enjoying myself unencumbered by the need of everyone else’s approval. I hope it comes around soon. The people on the screen are so real and happy; at that age they learned to deal with death – their imminent own and their friends’; lifetimes behind them add a whole another dimension to the songs they are performing. “I will survive”, “Staying alive” and “I wanna be sedated” take on a different meaning when sung by an 80-year-old with oxygen tubes in his nose. The funniest part is that these people are completely aware of the irony and enjoy it just as much as their audiences. At the end of the movie a man named Fred Knittle sings “Fix You” by himself because his duet partner died few days before the concert. Fred passed away last week. This is probably the most touching and heartfelt rendition of any song I’ve heard in many years, oxygen puffs and all. 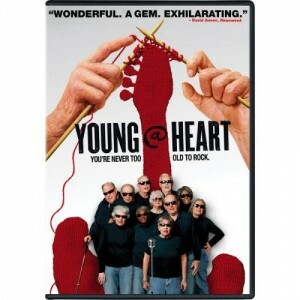 Young@Heart – the best and the most uplifting movie of the last year, documentary or not.